As principals of Southern Hills Real Estate & Development, Inc., Jeff and John Read have been building homes for more than two decades. 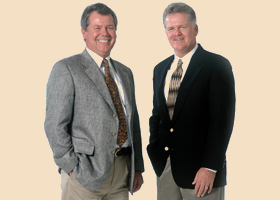 A true testimonial to their commitment is that both brothers have owned homes at PGA WEST® since the early 1990s. And they are the second generation to do so for their parents are homeowners at The Summit at PGA WEST®. As developers of The Summit, Jeff and John remain the only builders in the Premier Builders of PGA WEST® who live in this exclusive community. During the mid 1980s, the company was responsible for building more than 1,300 homes in the San Francisco Bay Area. Today its focus is in the Coachella Valley. In addition to developing The Summit at PGA WEST® in La Quinta, Southern Hills has a reputation for building spectacular custom homes in the some of the most prestigious country club communities in La Quinta.